O’SCALLYWAG is a knitted Scarecrow who lives in Balingup. He likes travelling and has been a few places. He also likes to stay home, especially at Easter and for the Small Farm Field Day. These are the times the People Family come camping from Perth and loads of scarecrows gather in Balingup. You can see O’Scallywag in the middle of this picture. His partner, SALLY, is in Auntie Fiona’s lap, and Sally’s son, BOY is being held by THE CELEBRANT – one of the Giant Scarecrows made by the People Family at Easter, 2010. If you go well up Lukis Street you can still see The Celebrant with the EASTER WEDDING couple at the Rainbow Hill gate, but they’re getting old and jaded now! 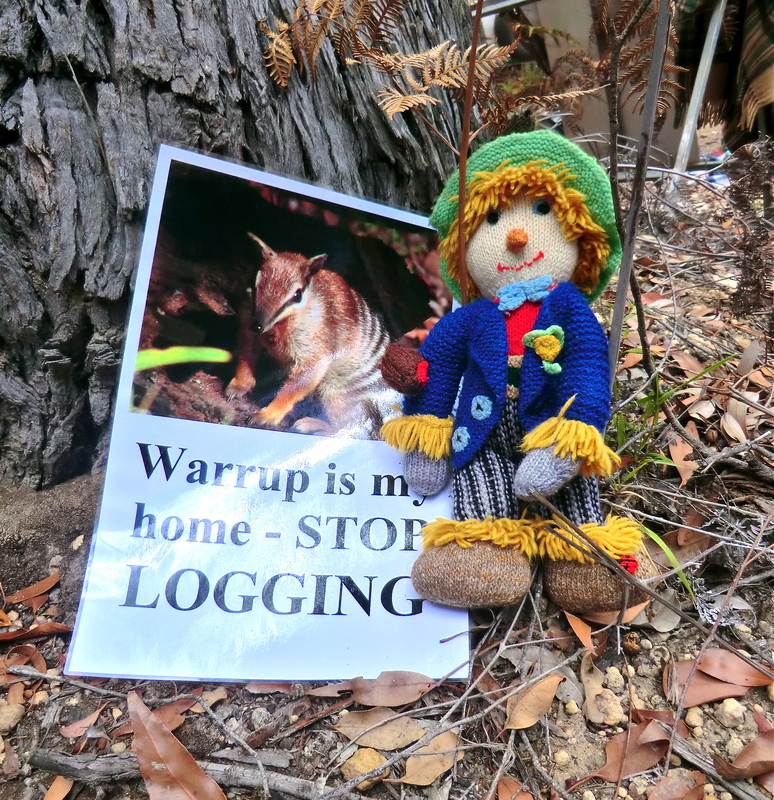 The next picture is of O’Scallywag on a visit to WARRUP FOREST, near Bridgetown, not so far from Balingup. He is dreaming about the forest in the shade of a snottygobble. There are a lot of people wanting to keep the forest safe for the birds and animals who live here. A big, very old, friendly MARRI TREE invites O’Scallywag into its hollow. He thinks how interesting it would be to be a NUMBAT and live in a hollow tree or log, or how cool to be able to fly right up into the high, leafy branches and perch there like a cockatoo. “But I don’t ‘ave fevvers, let alone wings,’ he sighs. “What if someone wanted just a bit o’ me wool? Say they come along an’ ‘elp ‘emselves to it? I’d start to come all undone – me robin an’ me mouse an’ me ladybug ud’ come all unravelled as well, coz’ they’re all knitted out of the same bit of wool as me! This story, along with it’s pictures, are taken from a brochure written and produced Jenny de Garis for the Telling Tales Balingup Children’s Literature Festival. It provided a way of discussing the issue of deforestation with children.